Ukrainian police have detained two men with a package presumably containing a homemade explosive device near Russia’s consulate in the city of Odessa. The explosive has been sent for inspection, the local Ministry of Interior reports. "Today, on June 16, on the corner of Posmitnogo and Genuezskoi, two individuals were detained [who were] carrying a package in which there was a subject similar to an improvised explosive device. These persons were detained a few hundred meters from the General Consulate of the Russian Federation in Odessa, where at that time a rally was being held,” police said in a statement. 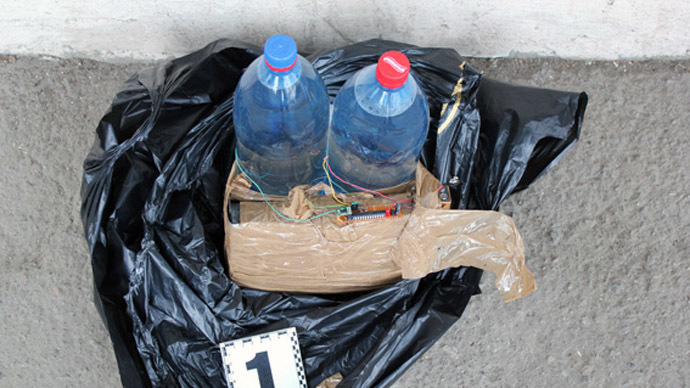 Pictures of the suspected explosive device have been released on the Interior Ministry's website. The images show a black plastic bag with two plastic bottles filled with an unidentified clear liquid. Wires and a power supply, as well as a box with metal elements, have been connected to the bottles with sticky tape. Investigators suspect the metal parts were aimed at harming people during an explosion. Security around the office was boosted as protesters brought tires and funeral flowers. Earlier on Monday, there were reports that police detained four protesters carrying explosives and a knife outside the Russian consulate. It was said that the four were involved in a brawl with officers, in which several people were injured. 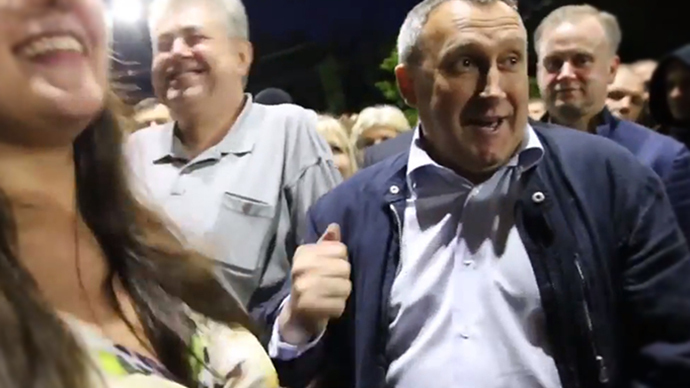 The chairman of the Odessa Regional State Administration, Igor Palitsa, said that the four activists behind the clashes are members of the nationalist Svoboda (Freedom) party. Palitsa said he has already received calls from Kiev asking him to release those detained. 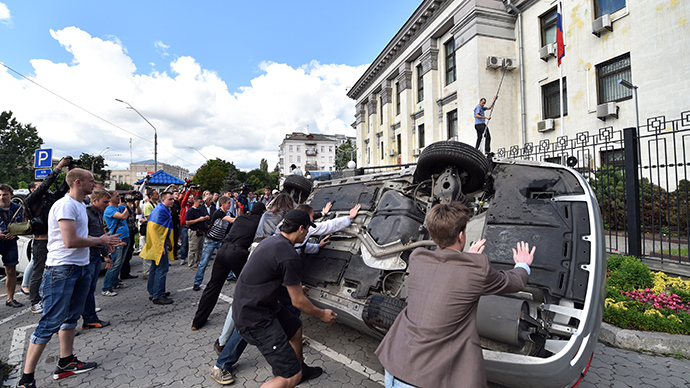 The rally in Odessa comes two days after the Russian embassy in Kiev was attacked by protesters who vandalized the premises and piled up tires to block entry into the building. They threw stones, smoke grenades and eggs at the building, and overturned several diplomatic cars. The crowd of violent activists was later joined by dozens of masked and camouflaged radicals of the Maidan self-defense troops, the Right Sector, and the nationalist Svoboda party. 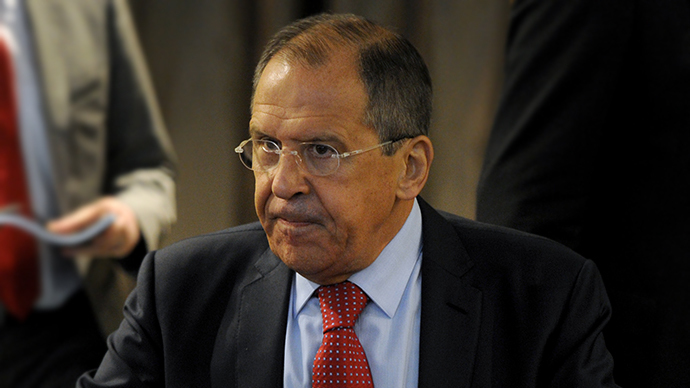 Russian Ambassador to Ukraine Mikhail Zurabov said the attack was thoroughly planned.